It makes cleaning and sorting and tidying on a daily basis kind of pointless. But unfortunately it’s necessary at some times of the year — at least if we don’t want our friends and relatives to think we’re complete slobs. One mom has the perfect solution. Clean your room, then make it off limits to the rest of the family. 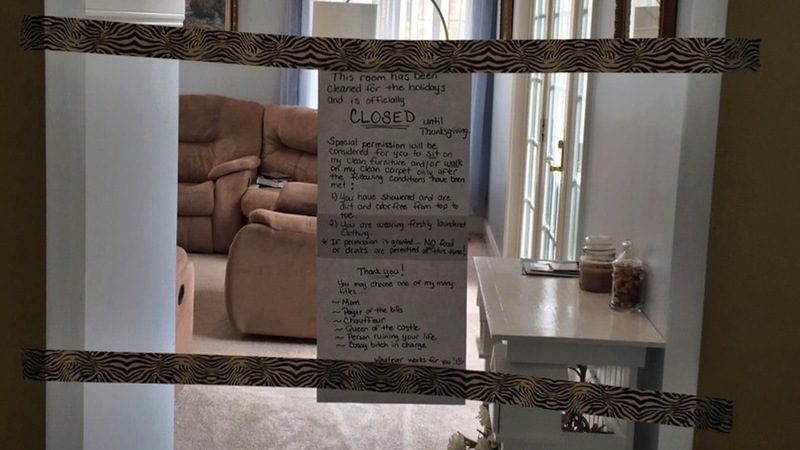 Michele Keylor from Ohio hung a “closed” sign on the door of her just-cleaned living room, and it’s gone viral after her 17-year-old son Nick Denbow shared a photo of her handwritten note on his Twitter account. She also revealed that during the cleanup she discovered french fries, dog toys, coins and dirty socks. Nice. For moms of younger kids a handwritten warning has obvious flaws (a child’s reading ability for one) but it can inspire a similar approach. A padlock, perhaps?